Aldo van Eyck was born in Driebergen, Holland, on 16 March 1918. At the age of one and a half he moved with his parents and brother, Robert, to England. From October 1919 to July 1935 he resided in London where his father, the poet P.N. van Eyck, was the London – foreign – correspondent of the Nieuwe Rotterdamse Courant, a major Dutch broadsheet newspaper. Aldo van Eyck’s mother was the daughter of the pioneer educationalists in the Dutch West Indies, Herman Daniël and Guilharmina Benjamins. He had a classic but unconventional education in England, first at King Alfred School in Hampstead London (1924–32) and subsequently at Sidcot School in Somerset (1932–35), both were progressive schools where the arts, literature and the humanities were highly placed. In 1935 the van Eyck family returned to live in Wassenaar (South-Holland). Aldo started his studies in Architecture at the nearby Senior Technical School (MTS) of the Royal Academy of Visual Arts in The Hague. In 1938 he accepted a place at the Eidgenössische Technische Hochschule, the ETH, in Zurich in order to complete his architectural studies in a cosmopolitan and more dynamic part of the world of art and architecture. While he graduated in 1942 his, first commissions were in Zurich where he remained until autumn 1946. Hannie van Eyck was born in Middelburg (Zeeland), also in 1918. She grew up and went to school first in Zaandam and then in the Hague and also ended up at the ETH and later at the University in Zurich. 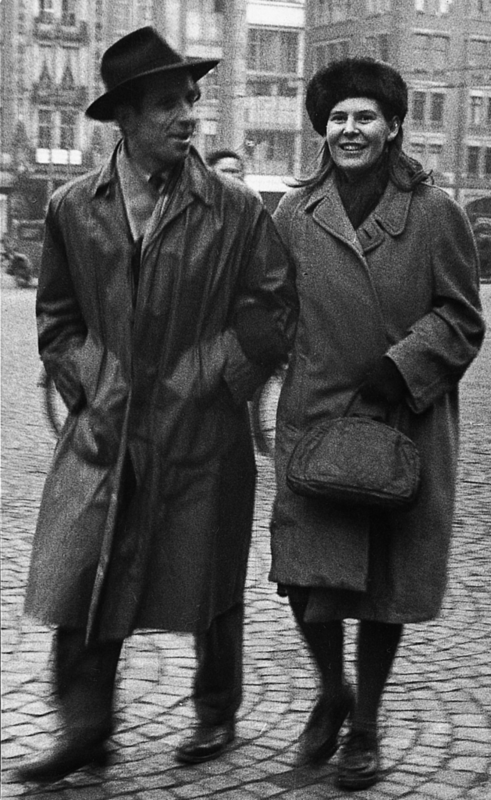 It was at the ETH where Aldo van Eyck met Hannie van Roojen, a Dutch fellow student , they became friends and were married in 1943. They were compelled to stay in Zurich, away from Nazi occupied Holland, during the war and did so completeing their studies and finding the emerging world of debate on architecture and urbanism through some of the originators of CIAM. They had the first of their two children: a daughter, Tess (born in Zurich in 1945) and in 1948 a son, Quinten (born in the Netherlands). Hannie van Eyck from this time onwards worked with Aldo on most of their projects and in 1970s she began to do her own work and after the dissolution of the Van Eyck – Bosch partnership BV in 1983 took up full time collaboration with the office of A+H van Eyck Architecten BV as a partner. During their studies in Switzerland Aldo and Hannie van Eyck had become friends with Sigfreid Giedion the historian, critic and writer of Space Time and Architecture and his wife Carola Giedion-Welcker, an art historian who was engaged in an in-depth study of modern art. The Giedion’s held compelling dialogue on the emerging radical interpretations on the subject of art and architecture with a large influence across Europe and wider afield. Through Carola Giedion-Welcker the young Aldo van Eyck entered into the world of the twentieth-century avant-garde world of Sigfreid Giedion and Le Corbusier’s CIAM and artists including Arp, Vantongerloo, Tzara and Brancusi and subsequently many others who were lookingthrough the lens of an egalitarian society. In 1946 the young family settled in Amsterdam where CIAM secretary Cor Van Eesteren, the city architect and planner of Amsterdam, whom Aldo had met in Zürich, engaged him as an architect and designer, to assist in the Urban Development section of the Public Works department (1946–51). There he looked at, studied and deliberated on the planning of the city at both the large and small scales and on many layers and was assigned to design the public playgrounds for Amsterdam’s children. It was a city-wide project that enabled him to start the development of new thinking and experimental forms for a more inclusive modern architectural and urbanistic language. The childrens playground projects continued on into his own practice, which he started with Hannie van Eyck, Sandy van Ginkel and Jan Rietveld in 1951. He designed and was involved in the making of some 750 playgrounds (1947-1978), gradually evolving a network of places injecting new life into the urban fabric and in doing so he created a legible web throughout the urban mass, giving children their own recognizable domain within the city. The start of the playgrounds project coincided with his involvement in the Cobra movement (1948–51). He became friends to Appel, Constant and Corneille, and actively took on their defence. He made layouts for two of the Cobra artists exhibitions, in Amsterdam (1949) and in Liège (1951). Aldo van Eyck and Shinkichi Tajiri discussing Tajiri’s exhibition at Stedelijk Museum Amsterdam, 1967. Aldo van Eyck saw, early, the clear linkages between fine painting, sculpture, applied decoration and architecture and retained a keen interest and involvement in all of the arts throughout his life, including the modern, classical and tribal and worked with artists on exhibitions and within his designs and collaborated with Appel, Constant, Karl Visser, Shinkichi Tajiri and Joost van Roojen. In 1947 he became a member of the Dutch CIAM group ‘de 8 en Opbouw’ which appointed him as their delegate to attend the international meetings of CIAM both in national and international meetings, he took a fundamentally critical stand right from the start. In 1947 Aldo van Eyck was appointed a key participant in the planning of the new village of Nagele along with ‘de 8 en Opbouw’ in the Noordoostpolder. He acted as the group leader, the coordinator and ultimately the designer of the master plan. Aldo van Eyck proved to be one of the most inspired members of this group. He developed a personal version of the Team 10 ideology, a view he was to expound in the Dutch architectural review Forum, notably in 1959–63, when he was a member of its editorial staff, with Apon, Bakema, Boon, Hardy, Hertzberger and Schrofer. CIAM’s analytical method of measuring life in the city and land use by density and the mapping of just the so-called four main Functions – dwelling, work, recreation and transport – were considered by Team X to be too simplistic as it did not show the overlapping and intertwining of uses, events or the details of its richness and sensitivity and reasons why certain neighbourhoods had and should be allowed and continue to thrive as an integral part of the developing and expanding urban form. Following the completion of projects for the town plan for Nagele village, some houses, schools and exhibitions van Eyck gave his ideas a fully elaborated form in the Amsterdam Orphanage (1955–60), ‘a house like a tiny city’. This building received worldwide admiration and became a paradigm for the new design approach, the so-called configurative discipline which was taken on and developed by Piet Blom, Herman Hertzberger and Joop van Stigt. The synthesis of place and occasion van Eyck posed was published in his 1962 essay entitled ‘Steps Toward a Configurative Discipline’ and was a key to the construct – the idiom – he had begun with his architectural and urban interventions and designs for the Amsterdam playgrounds, the housing at Slotermeer he did with Jan Rietveld and the Nagele village plan and schools. This evolving architectural language was continued in his designs for the Orphanage where the scale of the programme and its resulting morphology are allowed full play with form and construction inside the immutable requirement for, simultaneously, a private home and good homecoming for the children in a meaningful urban place based on a harmonious plan of what was to be and has become a well defined and charismatic part of the city. Subsequently Van Eyck condensed his ideas in some particularly weighty designs: first came his prize-winning but unexecuted competition project for a protestant church, ‘the Wheels of Heaven’ in Driebergen (1963). This was followed with the catholic Pastor van Ars church in the Hague (1964–69), the Sonsbeek Pavilion in Arnhem (1965) his plan for the Nieuwmarkt in Amsterdam and his designs with Jaap Bakema for the Buikslotermeer. From the end of the sixties he went on to apply his approach in the context of historical towns, first in his competition design for the Deventer town hall (1966, another prize-winning but unexecuted project), and then in the renovation projects for the Amsterdam Nieuwmarkt and Jordaan quarters (1970), and for the inner cities of Zwolle (1971–75) and Dordrecht (1975–81) – all of them urban housing projects which he developed and executed in association with Theo Bosch (1971–83). His most striking building of that period was the Hubertus House in Amsterdam, a home for single parents and their children (1978–81) which achieved a remarkable integration of a colourful functionalist language within an eclectic context. From 1983 Van Eyck worked in association with Hannie. Their projects show a further liberation from CIAM rationalism and a passionate exploration of new possibilities in the fields of structure, form and colour. The major works they achieved, a church for the Moluccan community of Deventer (1983–92), the ESTEC complex in Noordwijk (1994–89), the Auditor’s Office in The Hague (1992–97) and the Tripolis complex in Amsterdam, embody a union of biomorphic forms and flowing space. Throughout their life together the Van Eycks’ developed an active anthropological interest. As a result of broadly oriented reading they acquired an uncommon knowledge of the most diverse non-Western, archaic cultures. They travelled extensively in order to get more closely acquainted with these cultures. They were collectors and connoisseurs of ‘tribal’ and ethnographic art from all continents which, together with classic and modern Western art, formed their major source of inspiration. Aldo van Eyck died in Amsterdam on 14 January 1999. 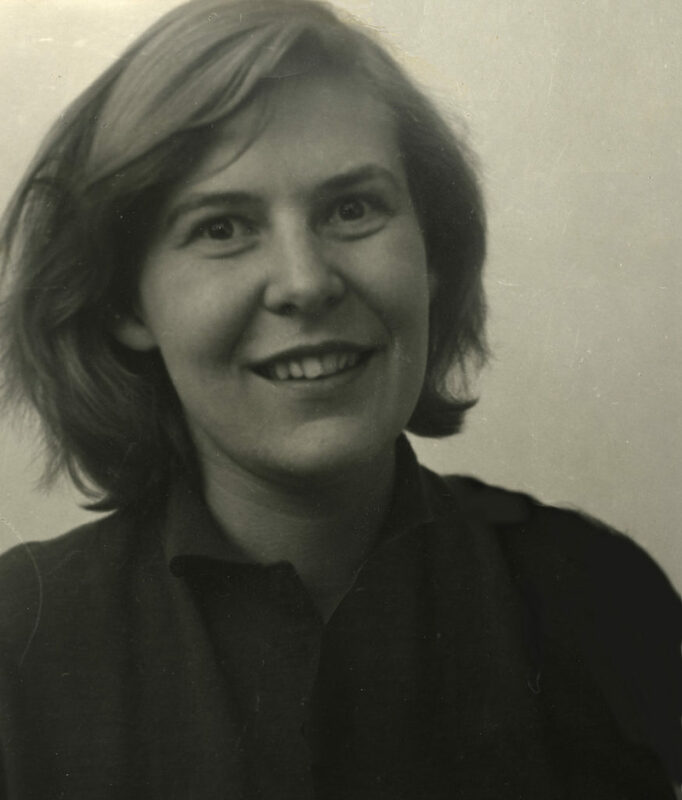 Hannie van Eyck van Roojen died in Zonnestraal (Hilversum) on 18 March 2018.